Left: TaylorMade's new P770 iron; Right: TaylorMade's new P750 Tour Proto iron. 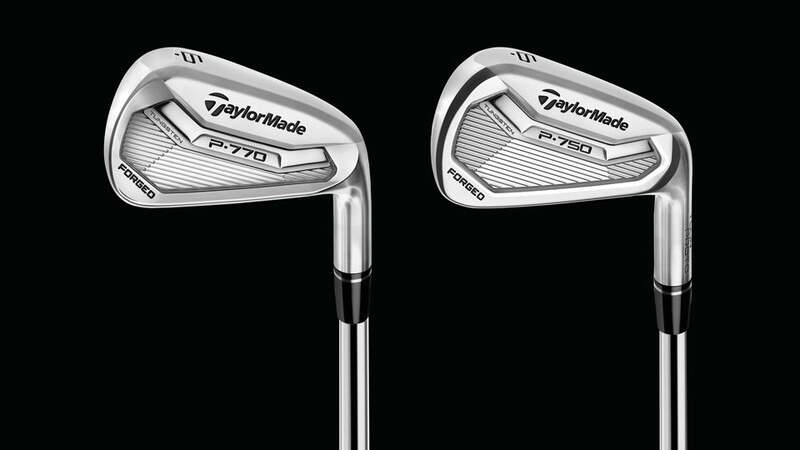 After months of testing with its Tour staff, TaylorMade is set to debut two players irons that'll replace the PSi and PSi Tour: the P770 irons and the P750 Tour Proto irons. Both new models have minimal offset, thin toplines, short blade lengths and traditional lofts to appeal to skilled golfers. Forged from 1025-carbon steel, the P770 has precision-milled faces and grooves for predictable, consistent performance. The 3- through 7-irons have a 70-gram tungsten bar positioned low in the back to boost stability and launch. The bar is lighter in the center than the heel and toe to create more perimeter weighting. Compared to the company's RSi TP model, these compact heads have a slightly higher peak trajectory, 11% lower CG and 10% higher MOI. At the same time, the one-piece, forged cavity back short irons (8-AW) provide added control. The shallow head profiles, shortened hosels, and tapered faces (thinner on the upper portion) help to optimize CG across the set. But don't expect these sticks to have the company's signature slots on the face or sole. According to Tomo Bystedt, Senior Director, Iron Creation, “Clubs like these have a thicker, rigid face so slots wouldn't make much of a difference.” $1,200, with KBS FLT steel shafts; in stores March 31. The forged P750 Tour Proto is for players who want maximum workability. World #1 Jason Day has the Tour Proto in his bag, as does Justin Rose, who played the set during his 2nd place finish at the Sony Open earlier this month. The clubs have a thinner topline and less offset than the P770, along with a narrower sole and sharp leading edge to improve turf interaction. A five-gram tungsten sole weight in the 3- through 7-irons helps center the CG for added maneuverability and increased launch. And, the company controls thicknesses, CG and mass distribution by milling the face, grooves and cavity. $1,600, with True Temper Dynamic Gold shaft; in stores March 17.